We’d love your help. 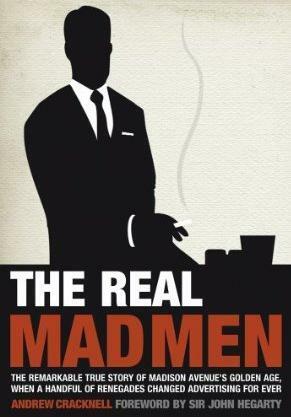 Let us know what’s wrong with this preview of The Real Mad Men by Andrew Cracknell. Advertising is a business rooted in art, an art rooted in business, and it reached its peak in a specific place at a specific time: New York City at the end of the 1950s and into the '60s. Like AMC's award-winning drama "Mad Men," this book looks at the industry that shaped a culture. The" Real Mad Men" is a visual history of key major ad campaigns during the 1950s and 196 Advertising is a business rooted in art, an art rooted in business, and it reached its peak in a specific place at a specific time: New York City at the end of the 1950s and into the '60s. Like AMC's award-winning drama "Mad Men," this book looks at the industry that shaped a culture. The" Real Mad Men" is a visual history of key major ad campaigns during the 1950s and 1960s and the people responsible for them. Beginning with the iconic VW campaign that kicked off the "Creative Revolution" it covers campaigns such as Avis, Alka Seltzer, Benson & Hedges 100s, Volvo, Chivas Regal, and Braniff Airways. To ask other readers questions about The Real Mad Men, please sign up. A quick and easy to understand history of the people and decades that changed advertising forever and inspired (in part) the hit AMC tv show. It's pretty obvious that the author is a giant fanboy of some of the people he writes about - he actually makes no attempt to hide this - so I'm taking it as a bit biased, but it does give a fantastic overview of who's who and what's what. My one problem with it is that there are almost no images of the campaigns mentioned and the ones that are there are sm A quick and easy to understand history of the people and decades that changed advertising forever and inspired (in part) the hit AMC tv show. My one problem with it is that there are almost no images of the campaigns mentioned and the ones that are there are small enough that you can't really read the copy. I would have loved a chance to see examples of every campaign mentioned and be able to read the body copy on them. The author clearly doesn't like the TV show Mad Men and thinks that's it's an unrealistic portrayal of 1960s advertising out of Madison Avenue... But the book makes clear reference to the tv show, every chapter opens with a quote from the show and most chapters mention at least one character reference and how unrealistic they are. One of the last lines mentions Don Draper. I think the author has some issues with a TV show that he has piggy backed on to sell his book. It's an interesting summary r The author clearly doesn't like the TV show Mad Men and thinks that's it's an unrealistic portrayal of 1960s advertising out of Madison Avenue... But the book makes clear reference to the tv show, every chapter opens with a quote from the show and most chapters mention at least one character reference and how unrealistic they are. One of the last lines mentions Don Draper. I think the author has some issues with a TV show that he has piggy backed on to sell his book. It's an interesting summary read of what was undoubtedly a fascinating time. But this book seems to just bring together elements of what other people have mentioned in other books or articles. I suppose that's a good thing. I had no knowledge of the "real Mad Men" and what sorts of characters they were. I do now. But i also now know the names of other books to go and read that will deal with particular people and companies in more detail. It's a very good summary book. I'd recommend it for anyone who likes the tv show or is interested in advertising. 3.5 stars because I find advertising much more interesting since watching Mad Men, and this book does a good job of going behind the scenes of NYC's biggest and most progressive agencies during a revolutionary time period in the industry. Ads from the 60s look so much more interesting than ads of today, and there are a lot of them in there (and the print is often very small, but not too small to read most of the copy, which was also interesting). 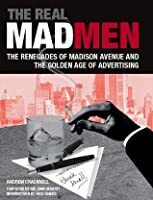 In case you're wondering, ad men usually didn't a 3.5 stars because I find advertising much more interesting since watching Mad Men, and this book does a good job of going behind the scenes of NYC's biggest and most progressive agencies during a revolutionary time period in the industry. Ads from the 60s look so much more interesting than ads of today, and there are a lot of them in there (and the print is often very small, but not too small to read most of the copy, which was also interesting). I read this book to better understand the world I was born into in the 1960s. Informative and delightful. An uncomfortable read. This book gives an overview of the Metro US advertising scene in the 1950s and 60s. As a historical artefact, it certainly has value in giving an account of the new breed of creative-led agencies, the personalities behind them and campaigns they produced. I found the shoe-horned Mad Men references irritating (and horrendously dated) and the seemingly endless queue of personality-based anecdotes rather wearing and tedious. Perhaps, this was unique to the timing of my readin An uncomfortable read. This book gives an overview of the Metro US advertising scene in the 1950s and 60s. As a historical artefact, it certainly has value in giving an account of the new breed of creative-led agencies, the personalities behind them and campaigns they produced. I found the shoe-horned Mad Men references irritating (and horrendously dated) and the seemingly endless queue of personality-based anecdotes rather wearing and tedious. Perhaps, this was unique to the timing of my reading, but what troubled me most though was the morally tone-deaf way in which the book described the institutional misogyny, sexism and discrimination rife in the industry. It is depressing to see how the majority of the most creative, progressive agencies reflected their own narrow interests and kow-towed to the prejudices of their even more blinkered clients. A general sweep on the history of 20 century New York advertising agencies. A tenuous link to the Mad Men TV series is good marketing. Apparently the author states that it took 18 months to write this book - why? The start of this book is interesting but it quite quickly loses this pace and becomes little more than Person A was an ad man, he did this. Person B was an ad man, he did this. Etc. Advertising is an industry almost everyone loves to hate. The popularity of the TV series Madmen about the golden age of advertising in the 1950s and 1960s and the interest around it is the spur of this history. Advertising went through some revolutionary changes and was plugged into the culture of postwar America. The ad campaigns of this period were genius. The sexism of the period depicted in Madmen is probably overblown as women did some very innovative campaigns and did pretty well in the b Advertising is an industry almost everyone loves to hate. The popularity of the TV series Madmen about the golden age of advertising in the 1950s and 1960s and the interest around it is the spur of this history. Advertising went through some revolutionary changes and was plugged into the culture of postwar America. The ad campaigns of this period were genius. The sexism of the period depicted in Madmen is probably overblown as women did some very innovative campaigns and did pretty well in the business. Some of the more interesting campaigns were on the Volkswagon Beetle which started out as a "Nazi people's car" and was turned into the "love bug" and forever associated in the public with the sixties hippies. Or the idea of selling Avis as number two so we try harder. The ads from the era illustrated in the book are beautiful on their own , smart and slick. This is also the era where market research came into its own. It also features some really influential political ads like the "Daisy ad" which shows a little girl picking flowers and counting down and then jumps to a real countdown and a mushroom cloud. This ad was made for the Johnson campaign to portray Goldwater as a dangerous extremist who should be nowhere near the nuclear button. Wenn Sie in der Werbebranche arbeiten, kann ich Ihnen dieses Buch nur empfehlen. Viele Bücher konzentrieren sich auf Werbung aus der Perspektive der TV Show Mad Men (Handlung spielt in den 60er-Jahren), aber dieses Buch behandelt, was zu dieser Zeit wirklich in der Werbebranche Gang und Gebe war. In den 60ern Jahren fand die sogenannte „Creative Revolution“ statt - in der Werbung fanden drastische Veränderungen statt. Dieses Buch zeigt Ihnen anhand von vielen Werbebeispielen (Fotos in schwarz-wei Wenn Sie in der Werbebranche arbeiten, kann ich Ihnen dieses Buch nur empfehlen. Viele Bücher konzentrieren sich auf Werbung aus der Perspektive der TV Show Mad Men (Handlung spielt in den 60er-Jahren), aber dieses Buch behandelt, was zu dieser Zeit wirklich in der Werbebranche Gang und Gebe war. In den 60ern Jahren fand die sogenannte „Creative Revolution“ statt - in der Werbung fanden drastische Veränderungen statt. Dieses Buch zeigt Ihnen anhand von vielen Werbebeispielen (Fotos in schwarz-weiß, aber auch in Farbe) die Mechanismen der Werbung in den 60ern Jahren (von den ersten Kampagnen für den VW Käfer bis hin zu Polaroid und den ersten Fernsehwerbungen). lets not beat around the bush - referencing "mad men" is a clever advertising ploy to sell a book that has as much in common with mad men as I do with Betty Draper. It's a little dry at points, yabbing about a whole heap of people I don't know, nor does it really explain them all that well, but then it goes into some analysis of some of the most iconic ads in the era - VW, Polaroid etc and it keeps you interested. I like books that lead you on to other books, and this is one of those. As well as being an entertaining read, both for advertising reasons, and to read something relating to Mad Men (a series I happen to like) it has neat pictures of the great ads it talks about installed throughout. Andrew certainly knows his stuff and he makes reading about Ogilvy and the gang highly interesting. Well worth a read, if you're into this kind of thing. 'I lived through half of what Andrew Cracknell writes about - and there's so much action on each page, my head was spinning. The Real Mad Men nails those days in real time - but take a valium before you read it. It's an eye-popping, roller-coaster ride, and the true story of the original Mad Men. Reading any chapter in Cracknell's book beats the hell out of watching a dozen segments of Mad Men' George Lois. As someone who works in ad industry and a true fan of Mad Men series, I often imagine if I live in the mid 50s and work at the same industry. By reading this book, I could feel the sophisticated life, the thinking behind every great campaigns, the important feeling of being an ad dude in the era (well, today's ad industry isn't as glorious as it used to be, is it?). There is a certain romance when you read it if you have the passion for ad. Released following the success of the television show "Mad Men" this book covers the revolutionary history of New York/West Coast advertising in the 1950's and '60's. I had already read other books about this time frame and field. This was enjoyable, and clever them to tie their ad campaign for the book using the television show. A great, expansive overview of the advertising agencies of the 50's and 60's. The story moves a quick pace, jumping from agency to agency, explaining why they were revolutionary in one chapter or less. A must-read for anyone studying advertising or young in their careers (like myself) who want to understand what our employers used to advocate, tolerate, dismiss and hate decades ago. This book was read in order to fulfill my need for anything Mad Men related. I was disappointed that only a short section at the end was devoted to women in advertising, but I guess that's why it wasn't called Mad Women. An obvious attempt to capitalize on the series by an author highly critical of the acclaimed TV show, but also a very comprehensive history of the advertising industry’s seminal years. A little light in text, but many fantastic vintage photos. Good insight on 1950s-70s in advertising from Bernbach to Harper. Not really about Mad Men, but a little insight to what things were really like. This book disappointed me, and I dropped it midway. I'll probably pick it up again to finish while commuting (as I hate leaving things uncompleted). It's really interesting to see a new perspective of the ad world in that era. As a fan of Mad Men, I was happy to learn more and see how reality differed from fiction. Loved the sensational ads and vignettes about key figures in NYC's advertising history. But the overall narrative was primarily, 'and then and then and then,'... zzzzz. Interesting book on the changes the advertising world went through as it moved from staid WASPiness to aggressive creativity in the 1950s and 60s.